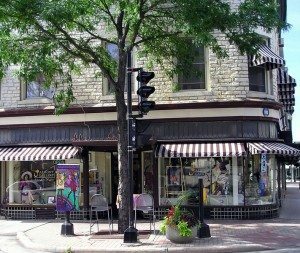 I’ll be signing copies of Janis Joplin Rise Up Singing, Such a Pretty Face and Silent Embrace, Perspectives on Birth and Adoption at Martha Merrell’s Bookstore in downtown Waukesha this afternoon beginning at 4:30. If you haven’t been here, you may find the 8′ guitars outside stores a bit amazing. These are to celebrate the birthplace of Les Paul so take the walking tour, stop and listen to live music and have fun! You’ll also find artist-painted Gibsons for sale. What a great way to celebrate summer in Wisconsin! If I can get photos, I will. Meanwhile, in case you’ve never been to Waukesha’s independently owned Martha Merrell’s. Look for the red awnings on the corner!